March Break Matinees! - All seats $5 (until Mar, 16). 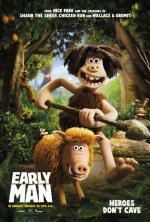 "Aardman Animation is back on the big screen! This time out, the folks behind the beloved claymation characters WALLACE & GROMIT and SHAUN THE SHEEP give us the story of Dug (Oscar winner Eddie Redmayne(! )), an adventurous young caveman and his best friend Hognob, a hog, of course.